It is tempting to think that the waves before the QRS are large P-waves, but in fact one can discern P-waves within these large waves (see V2 in particular). Thus, these are very late T-waves. Thus the QT interval is very long. I measure the QT interval at about 520 ms. Since the RR interval is about 560 ms, then the Bazett-corrected QTc is about 690 ms (very long). What part of the QT interval is long? Is the T-wave itself very wide? Is the time from T-wave peak to T-wave end (T-peak to T-end, or TpTe, long)? No! TpTe is perhaps the best predictor of Torsade de Pointe (TdP). The long QT is due to a very long ST segment. This is pathognomonic of hypocalcemia. The fact that hypocalcemia affects the ST segment and not the TpTe interval may account for the fact that TdP from long QT due to hypocalcemia is exceedingly rare, with only a few case reports (in which the etiologic link to low calcium is not even definitely established). In hypocalcemia (long ST, but NOT a wide T-wave, not a long TpTe), depolarization has a long duration, but repolarization occurs relatively quickly. The ionized calcium was 1.08 mg/dL. I do not have information on the etiology. This was an elderly woman who presented with altered mental status. Vital signs were normal except for an oxygen saturation of 91% and temperature of 35C. The T-waves are somewhat flat, but you can see that the QT interval is now about 370 ms, QTc about 460 ms, and a normal ST segment. The patient's mental status normalized. The etiology of the hypocalcemia was not investigated. 1. Hypocalcemia causes a long QT by lengthening the ST segment. 4. Thus, long QT in hypocalcemia does not appear to have nearly the risk of long QT from other etiologies. This comes from a manuscript that Dr. Ken Dodd and I have written. Ken was my primary co-author on the derivation of the Modified Sgarbossa Criteria. "In patients with normal conduction, the TpTe interval has been noted to prolong during myocardial ischemia and correct after reperfusion [1, 2]. It has also been claimed to predict mortality after myocardial infarction and has been called the best determinant of TdP development in the setting of acquired bradydysrhythmias . In patients with LBBB, prolongation of the TpTe has been shown to be independently associated with sudden cardiac death ." Eslami V, Safi M, Taherkhani M, Adibi A, Movahed MR. Evaluation of QT, QT dispersion, and T-wave peak to end time changes after primary percutaneous coronary intervention in patients presenting with acute ST-elevation myocardial infarction. 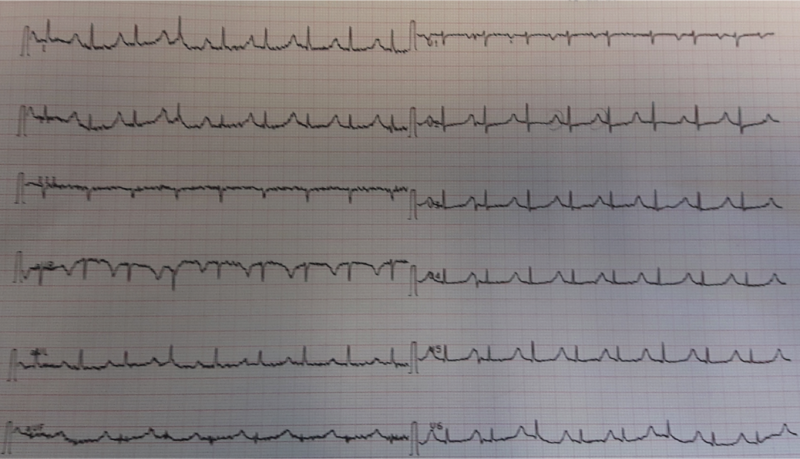 J Invasive Cardiol 2013;25:232–4. Gupta P, Patel C, Patel H, Narayanaswamy S, Malhotra B, Green JT, et al. T(p-e)/QT ratio as an index of arrhythmogenesis. J Electrocardiol 2008;41:567–74. doi:10.1016/j.jelectrocard.2008.07.016. Topilski I, Rogowski O, Rosso R, Justo D, Copperman Y, Glikson M, et al. The morphology of the QT interval predicts torsade de pointes during acquired bradyarrhythmias. J Am Coll Cardiol 2007;49:320–8. doi:10.1016/j.jacc.2006.08.058. Panikkath R, Reinier K, Uy-Evanado A, Teodorescu C, Hattenhauer J, Mariani R, et al. Prolonged Tpeak-to-tend interval on the resting ECG is associated with increased risk of sudden cardiac death. Circ Arrhythm Electrophysiol 2011;4:441–7. doi:10.1161/CIRCEP.110.960658. Many thanks for the case. But a question to ask: you said that it is pathognomonic. What about hypomagnesiuMia? I have long looked for ECG findings specific to HypoMg and have never found any, not in my own experience, and not in the literature? do you have any references? My understanding has been that ECG effects of hypomagnesemia are virtually the same as those with hypokalemia (ie, ST flattening, some ST depression, U wave prominence). Clinically, these 2 electrolyte disorders are often seen together — and correction of low K+ is often difficult until coexistent low Mg++ is also corrected. Sorry, I don't have references — but in my experience both clinically and with respect to ECG findings — I think about the possibility of hypomagnesemia whenever I consider hypokalemia. I have seen a lot of hypomagnesemia, but never ECG findings from it. And I can't find literature about it. Do you have some cases or literature? I've seen a lot of isolated hypoMg, without hypoK, and not seen ECG abnormalities other than long QT and Torsades (rarely). 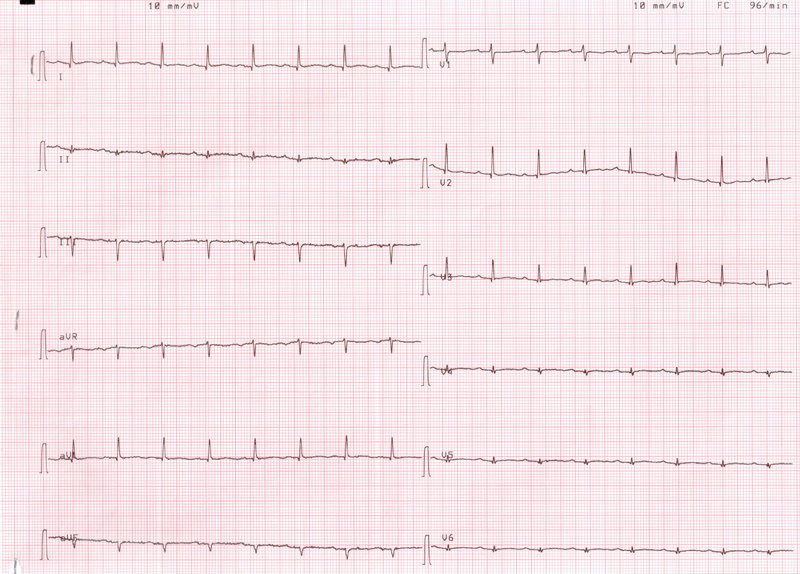 I want to find an ECG with other kinds of proven hypoMg findings! Great case! As is nicely described by Dr. Smith — the large peaked deflection preceding QRS complexes is not a tall P wave, but instead fusion of the T wave (in a patient with a markedly prolonged QTc) plus P wave. In addition, the T waves we see appear to be more-peaked-than-they-normally are (even though these T waves are not overly tall — and even though part of their peaking may be due to fusion with P waves …). But I’m curious what serum K+ was at the time of this tracing in this case? In days-gone-by — the finding of a fairly normal ST segment with marked QT prolongation, at the end of which was found a peaked T wave was a typical ECG presentation of longstanding renal failure (due to combined hypocalcemia + hyperkalemia). These days, ECG findings of hyperkalemia generally overshadow those of hypocalcemia. 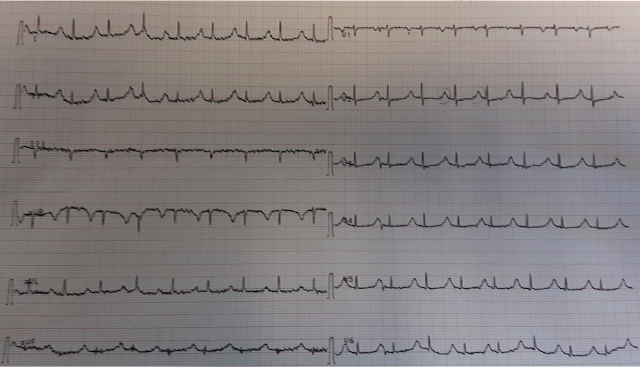 This case is one exception, in which the most remarkable ECG finding is that VERY long QT, with normal ST segment at the end of which appears an upright T wave. THANKS for posting this excellent reminder of the ECG findings of hypocalcemia that on occasion will still be seen. Before reading your comments and the papers you mentioned, I did know nothing on TpTe sign as predictor of TdP, but now I do. Many thanks for learning. But I could not be able to find your paper; perhaps does it wait for publication? I take this opportunity to send you from Italy my best wishes for Easter! sorry, we are still trying to get it published. 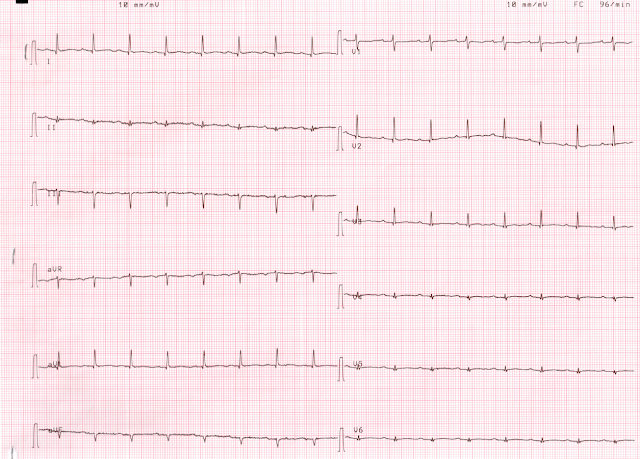 It is a paper on LBBB and QT interval.